XAVC video format was introduced by Sony in recent years, this format is used on Sony high-end camcorders, like Sony PMW-F55, Sony PMW-F5, PXW-Z100, PXW-180, etc. XAVC can support 4K resolution, so Sony 4K camcorders and cameras usually use this format now. XAVC can record 4K resolution at 60 fps with 4:2:2 chroma subsampling at 600 Mbit/s, so it has the advantage to store high quality videos, many professional users choose XAVC as recordings format. You may have used Sony high-end camcorders like PMW F55/F5, PXW-Z100, PXW-180, etc and recorded some XAVC footages, Many editors like importing footages to FCP X/7/6 for editing on Mac, and you may also have the need to import XAVC to FCP X/7/6 for editing. But, Final Cut Pro X/7/6 can’t support XAVC video well, because XAVC video codec is not good for editing in FCP on Mac, you may encounter XAVC to FCP importing problems, or you can’t edit XAVC smoothly in FCP X/7/6 on Mac. FCP best supported video codec is Apple ProRes codec, like Apple ProRes 422 or ProRes 4444, so the best choice to import XAVC to FCP is to convert XAVC to Apple ProRes 422/4444 codec, and then you can import XAVC video files to Final Cut Pro X/7/6 without rendering, and then you can edit smoothly. 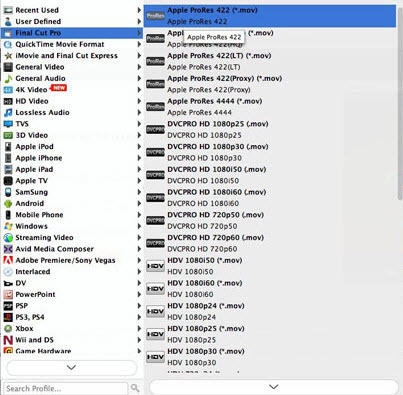 Here you can take a free trial on best XAVC to ProRes Converter-UFUSoft XAVC Video Converter for Mac, this software has optimized output format for Apple ProRes 422/4444 codec, it will convert XAVC to Apple ProRes 422/4444 with best video and audio quality. Besides, you can transcode XAVC to DNxHD for Avid, AIC codec for iMovie and Final Cut Express, or output to MKV, AVI, QuickTime MOV, MP4 and other formats. After running this software, click “Add File” to batch import the XAVC footage to the program. From the drop-down list of “Profile”, choose “Final Cut Pro” > “Apple ProRes 422 MOV” or Apple ProRes 4444 MOV as the output format. At last step, hit “Start” icon to start the XAVC to ProRes 422/4444 conversion. The whole process will take several minutes only. Then you can easily import generated XAVC to FCP, iMovie, FCE for editing. How to Import Sony a6500 4K XAVC S or AVCHD to FCP, iMovie, FCE?